We guarantee to complete your pool on time or we pay you! 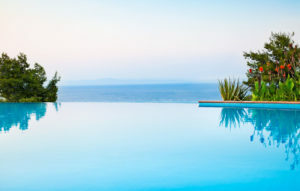 Also known as an infinity pool, zero edge or negative edge pool. This pool design creates a visual effect of water with no boundary. The water appears to merge with the horizon or other bodies of water. Also known as the skimmer type pool, this design is the most popular and cost effective. The water level remains below the level of the deck. The use of border tiles above the water line creates an artistic visual effect. At Sierra Pools and Spas we design and build each pool unique to each customer. Through the use of 3D design software and virtual reality, you will be able to experience your pool before construction ever begins! We will work closely with you throughout the entire design and building process to ensure that your backyard dream becomes a reality! Contact us today with your dream pool ideas.